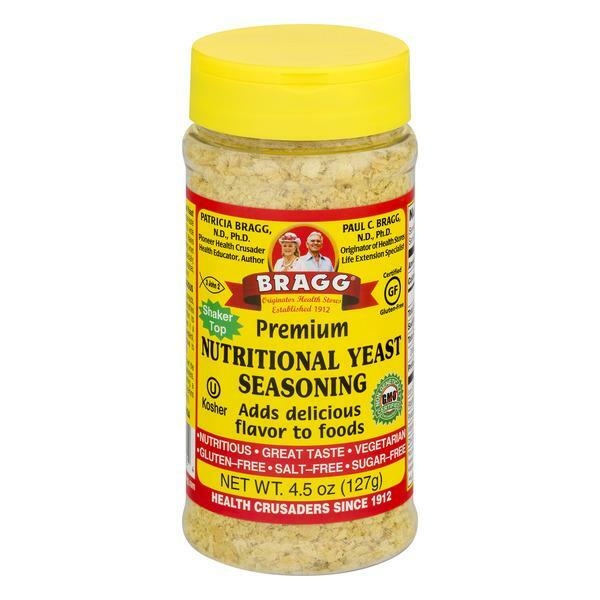 Bragg Premium Nutritional Yeast Seasoning provides great-taste and nutrition when added to wide variety of foods and recipes. Makes a healthy, delicious seasoning when sprinkled on most foods, especially: salads, vegetables, potatoes, rice, pasta and even popcorn! Nutritious & Delicious. Add to soups, dips, spreads, cereals, juices and smoothies for added flavor and nutrition. Its "cheese-like" flavor makes it a great no sodium, no cholesterol, delicious, healthy alternative to recipes and most all foods. Specific design to help meet the nutritional needs of vegetarians, vegans and anyone wanting a good source of B-complex vitamins (including natural vitamin B12). 3 john 2. See health recipes - bragg.com. Bragg Premium Nutritional Yeast. Seasoning is featured ingredient in leading health cookbooks including this Bragg Health Recipe Book. 700 recipes. Vegetarian Health Recipes For Super Energy To 120. Bragg Vegetarian 700 Health Recipes. Book only $16.95 postpaid to: Health Science Box 7, Santa Barbara, CA 93102 or 800-446-1990 weekdays. This product contains no salt, sugar, no egg, milk, gluten, wheat, corn, no starch, soy, animal derivatives, no artificial colors & preservatives, no Candida albicans yeast or brewery by-products as in brewer's yeast. Bragg???? Premium Sodium Free Nutritional Yeast Seasoning. Patricia Bragg N.D., Ph.D. Pioneer Health Crusader Health Educator, Author. Paul C. Bragg N.D., Ph.D. Originator Health Stores Life Extension Specialist. 1912 -2012. Celebrating 100 Years. Shaker Top. Sodium Free! Delicious flavor added to foods & recipes. Nutritious. Great Taste. Vegetrian. Gluten-Free. Salt-Free. Sugar-Free. Serving Health Worldwide Since 1912. Net Wt. 4.5 oz (127g). 25% off regular price. Price reduced after checkout if delivered or picked up by 4/30.